Since I was a child... I've been misunderstood. I hear lots of stories about how I was a bully and a brat. I was neither. The youngest in a family of 10 with numerous nephews and nieces to compete with for attention, I was only asserting myself. My family didn't recognize or understand that. That happened to me yesterday on Facebook. I posted a picture and wrote a little blurb. I think it came across as a "poor, pitiful me" blurb. This is not what I meant. I was attempting to merely point out that a life-saving drug I am to take for the rest of my life comes with a terrifying label. My post was misunderstood. I know there are LOTS of people who have it worse than myself, either by not being able to do much to stop the illness or unable to do anything at all. My brother, Jimmy, has been diagnosed with Stage IV kidney cancer and there is not much that can be done. The only intervention he has is a miracle from God. We pray for that. I know there are LOTS of people who carry a much larger cross than I do. My brother, Fred, is on dialysis and is a double amputee. He takes numerous drugs to live. He's been on dialysis for 6 years and the chances of him having a kidney transplant is non-existent. He could live like that for years. So what was all the fuss about over on Facebook? I'll show you. I have to take one of these pills every single day for the rest of my life. I didn't mean for it to come across as I was complaining about that. I meant to make the label the focus. The yellow one plastered across the bottle. Particularly the words "TOXIC" and "DISPOSE OF AS BIOHAZARD". I'm putting this pill into my body and this is the warning label on the bottle. 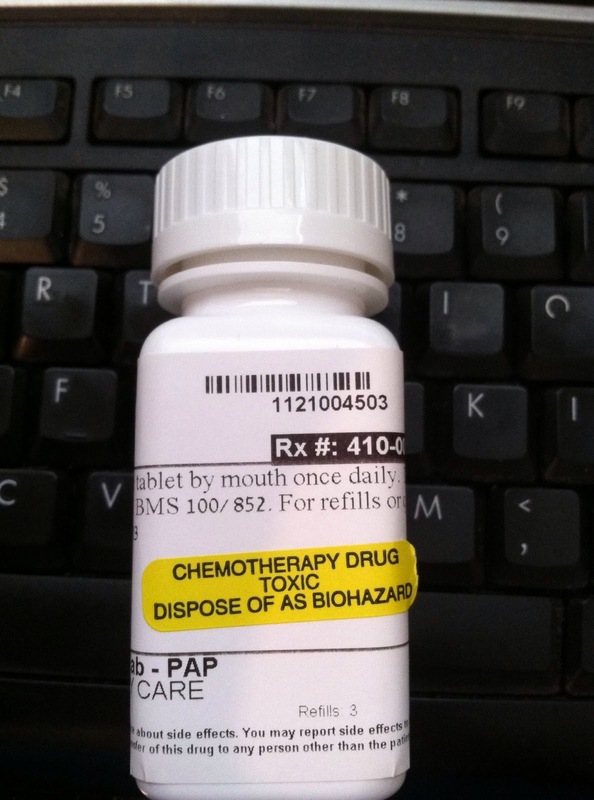 When I first started receiving my medication, I found the label frightening. Almost two years later, I find the label ironic. By the way... this is NOT the only medication I am taking. It's the only medication that comes with this yellow label. When I posted this on Facebook yesterday, I forgot people don't read what has been written all the way through. They read until something triggers them to respond. My final question on the post before posting the picture was "Isn't it a cheerful label?" It was a yes or no question. Not a post requesting information about how much worse the other person's fate was or how lucky I was to be able to take something or how many other people are living with a cancer. I wasn't even asking for pity. I was making a point... and then I asked a question that required a yes or no... maybe even an "lol". This is what I love about blogging. I can write to my heart's content. Whether it's read or not... it is not for me to know. I said my piece... and I continue with my life.